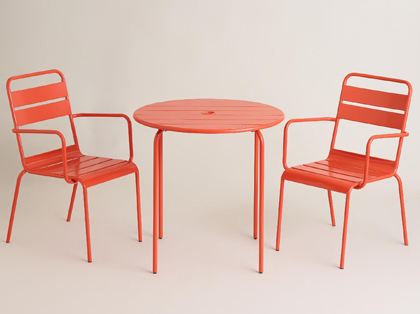 Bring modern bistro style home with this sleek Poinciana Ronan Outdoor Bistro Collection featuring a metal table and chair finished in vibrant red-orange. This compact collection is a sensible dining solution for the balcony, porch or other small alfresco area. $79.99-$119.98. Buy here. 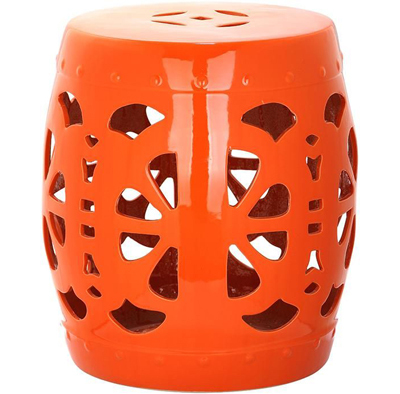 This Blossom Garden Stool is a multi-functional outdoor stool that opens up more ways to use your space. It’s an end table one minute, an extra seat the next. With an airy cutout design of enlarged blossoms on its sides, this drum-shaped garden stool is a stunner all around. $159. Buy here. Tunes on the beach are a must, but who wants to get their technology sandy, salty and sunblock-y? 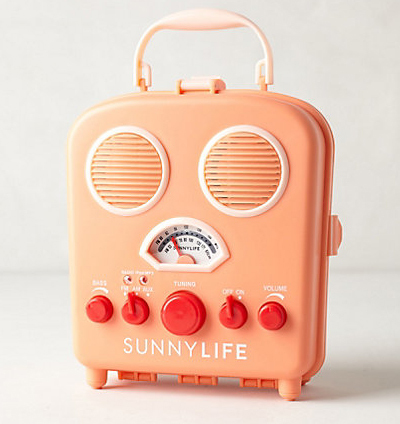 Tuck your MP3 player inside this water-resistant AM/FM Sunny Life Beach Radio for your worry-free listening pleasure. $49.99. Buy here. 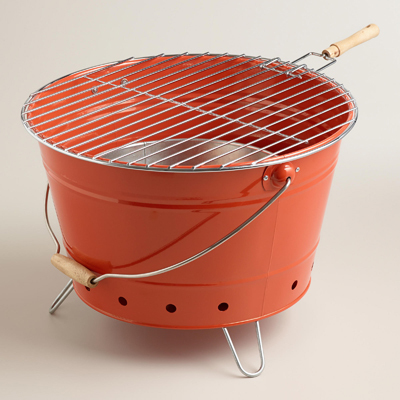 This Orange Galvanized Steel Bucket Grill lets you take the barbecue with you to a tailgate party, picnic, camping trip or anywhere! This built-to-last grill features collapsible metal feet and a removable chrome-plated grill for compact storage. It’s easy to set up just about anywhere, making it the perfect way to prepare delicious s’mores! $24.99. Buy here. 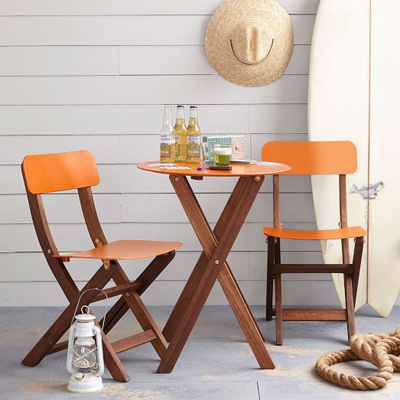 The Balcony Bistro Dining Collection brings bright style to the balcony. Add a fun pop of color to smaller spaces—including eat-in kitchens + dining rooms—with our metal and eucalyptus wood chairs + café table. $159-$399 Sale $135-$339. Buy here. 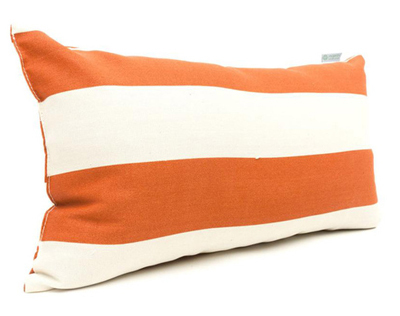 Add a splash of color and texture to any environment with this indoor/ outdoor plush Majestic Home Goods Vertical Stripe Small Pillow. This pillow features treated polyester with up to 1000 hours of U.V. protection, stuffed with a super plush polyester fiberfill. $31.49. Buy here. 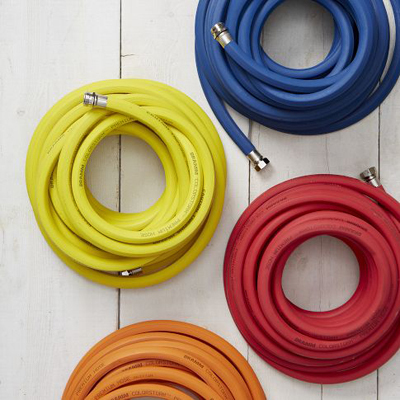 These professional quality Dramm Garden Hoses resist kinking and coil easily, even in cold weather. Nickel-plated brass couplings are crush-proof, even under your heavy boots. 50′. $69.95. Free shipping. Buy here. 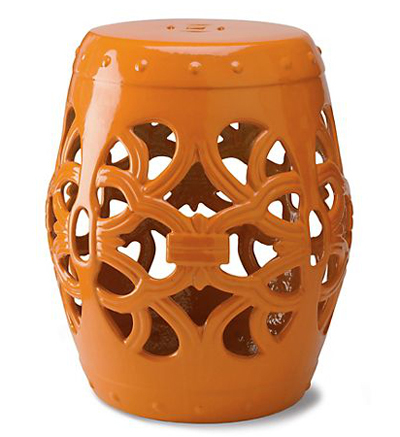 With its glazed orange exterior and knotted pattern, this artfully designed Knot Garden Stool brings a fun pop of color to any space indoors or out. $199. Buy here.